I thought it would be interesting to post it.(£5). 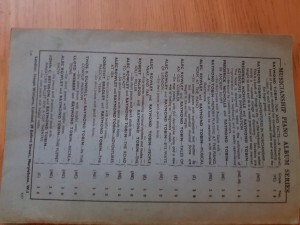 As far as I know this publication is not available in digital format.It was origninally published?printed in 1939 and this original blue copy is a rare survivor of this 1939 edition. 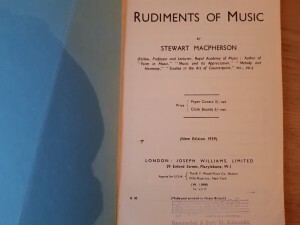 Stewart Macpherson was 37 when he worte this small book,(in 1903),so there may have been an earlier edition in print before the 1939 editions, I am not sure.He was also the Dean of Music at London University in his later years.He wrote many books on music.Google it or Wikipedia it.Istill recommend learning by ear, all the same. Alright , I dictate that music is a situation of nthe ear,and is not arational science of the eye tnhagt so much governs the stuff of are so called world and learning and science. This should definitely be believed in by people who require to enter the mysteries of what actually is avery ancient science of Music,It is a different thing to sciences of the Eye.It is a science of the Ear. So therefore it is totally ridiculous to apprfoach gthe science of music by the methods of the Eye. And this is exactly how the world dewals with music.Be on my side .The world is wrong in its aporoach to leatrning and teaching music,Music is avery simple free gift for the Ear People.For The Eye People it is almost an impossibilty and a fraudulent exercise. Therfore bare with me. and perhapos you be taking the unorthodox approach of learfning by experimentagtion of music to the ear. Having said this Music is a science.It is though a science of the ear. Perhaps look at it this way. Instaed of mathematics based on 10 numbers from 0 -9 it is based on sounds/notes from a-g( 7/8 notes).and their half notes , semitones. So a scale is seven spaces,ie. 8 notes from C of one Octave to C of the next Octave.This is why the piano is good instrument to learn on. If you look at the white notes from C of one octave to C of the next octave.You will notice that between note B and note C is a semitone, and likewised between not E and Note F.All the other spaces of thewhite keys are full notes/tones. Therefore it is note d that the natural flats and sharps ( semitones ) lie in these two places. The white notes on the piano reptresenta natural scale This scale is the scale of Major,A Major Scale. If you look at this scale closely you will see that it consists of the following tones and semitones. Tone/Tone Semitone//note//tone /Tone /Semitone.This is how you look at a scale.8 notes built up of two tetra scales.O( i.e a tetra scale being of 4 notes). So the Major scale of C represented by the white keys of the piano is na natural scale with natural sharps between the b and C and then E and F.
It is the Scale in the key C Major. All Major scales have the same configuration of Tones and semitones.It does include the Black keys in all other scales , so as to get the the right placement of tones and semitones. From the root note: Note//Tone / Tone /Semitone //Note//Tone /Tone //Semitone. That is a sequence of 8 notes seven spaces/notes. ie a scale .In the key of, as mentioned a specific major scale. So this is how the many musical scales are built.Out of a logical system,, a bit like the mathematics system. Note//Semitone/Tone /Semitone//Note//Semitone//Tone and a half//Semitone. So here we have it . The Major and the Minor scales. Once you start playing in a particular Key or Scale you can jam on those 7 notes and shift up and down the octaves on the piano ( or any instrument) and have some fun making up stuff to suit yourself. It is possible to switch into differrant keys as well sometimes when you get the feel for it. So it is ok to adapt the science of the Ear (Music) But not so cool to adapt the science of the Eye. 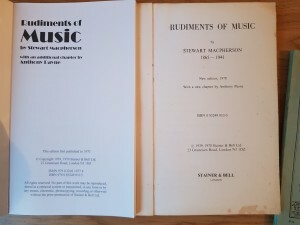 A very good exponent of the science of the Ear is Stuart MacPherson , a musician of ancient tradition from Scotland. 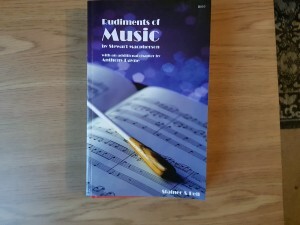 His short book called "The Rudiments of Music" is still on sale and is still the foundations learning exercise book of most musicians from the London Symphony musians to the Berlin Philomarnic Orchestra musicians, the world over. He was taught from his famiully through his generations as an Ear Science, not an eye Science. His book can be bought on Amazon.co.uk. Before we leave this exercise I will mention the Chromnatic Scale. If you take a note on the piano, ( or any instrument),ie C and play all the Black Keys and White Key up to The next octave, note C, youn will find that in total you have played 13 notes.Mostly semitones from one to another. This is called a Chromatic S.cale. You can jam around the instrumebt to your hearts content in that key up and down the different ocatves and make some real music to suit your self. You can move around to different keys sometimes as well. Now To Go further than this you can learn some more of the Ear Science as regards to more Scales and more music Science. To do this approach Stuarts MacPhersons short book." 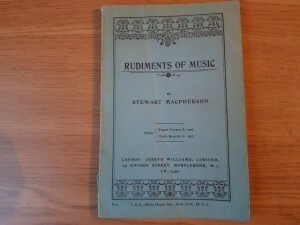 The Rudiments of Music." However Play it by ear and jam around with stuff on this hamishmusic page. If you get the feel for it as playing by ear always does,, the mosgtly yhou will be teaching yourself before to long, if music is the tghing you are liking,,then this will be the case. Good Luck and good one. Lastly, use your ears to learn.Listen to albums/CD,s and pick out the indevidual instruments with your ear.Imagine the fingers working on the guitar fretboard and play along in your imagination with your own imaginary guitar in your minds hands.If you practice doing this everytime with your favorite records,you will pick up a better way to read music.You can appply this learning when you pick up your instrument and gives fodder to keep you interested and to continue with. 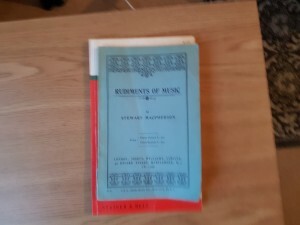 Understand a string of notes that please the ear.Understand the major and minor scales to put this into context of the science of music.Also note that their is a different scale for every note including their sharps and flats,so about 21 major sales and about 21 minor scales,(Some will be the same).All this by Ear. 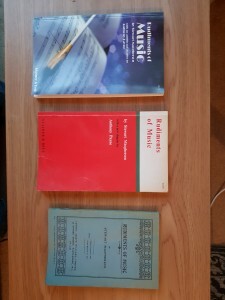 Having got this lesson you have absorbed the fundemental roots of music and can just carry it all the way by ear ,without referance to books.Understand your instrument and extend what you know accross its whole range.At a much later stage you can come back to the books if you wish for some additional clarification and insight. 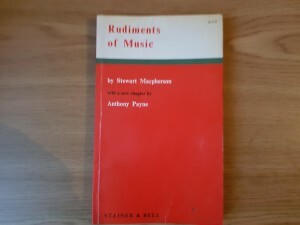 You may want to look at chromatic scales and harmony, for instance.I would recomend then a copy of Stewart MacPhersons "Rudiments of Music". 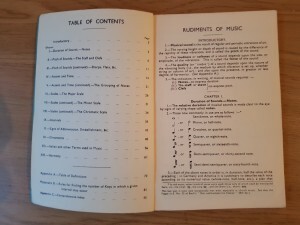 A nice little handbook which can be obtained in any good muisc shop.Dont be blinded by its waffle though! Each note has a minor chord as well a major chord. 1.Between the 2nd and 3rd note. 2.Between the 5th and 6th note. 3.Between the 7th and 8th note. This is the only differance.The placing of the semitones and the ammount of them.I leave the rest to you to get familiar by ear by messing around with this one as I told you to with the major scale.